The SUV maker has already tasted success with Quanto, which is a chop shop project on the Xylo. 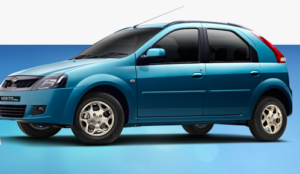 Not claiming to be the best selling compact SUV, the Quanto manages to sell in decent numbers.This time the company has run its chop shop project on the Verito platform and launched the Verito Vibe. With this latest offering, Mahindra claims to have cracked the sub 4 metre sedan segment with the Verito Vibe. So far it’s only the Amaze and Swift DZire which have been doing really well. Will the Verito Vibe change the convention? One thing might disappoint everybody is that there is no steering mounted controls even in the top end variant of the Verito Vibe. The rear boot opening is too small and as a result of those loading and unloading heavy goods might cause a big problem and there is also no switch or lock to open the rear boot door from outside the car. The Verito Vibe is a puzzling car – it offers great space in the cabin but a boot that is not very practical. The plastic quality isn’t the best in its segment, but the ride and handling compromise certainly is, even though it isn’t even trying to be a driver’s favourite. It retails at approximately Rs 6.6 lakh, ex-showroom, which means that it competes directly with the likes of the diesel Figo. Of course, it being a Mahindra means that spares will be inexpensive, and service will be available in most, if not all, corners of the country. If you value cabin space and the ability to carry five full-sized adults in comfort but don’t need brand value or a boot, the compact Verito will certainly give you good Vibes.